It is difficult to find the words to describe the majesty of the Norwegian fjords. Personally, it is one of the best tourist destinations in the world. In a single day you can admire its mountains, fjords, waterfalls, glaciers, cultural landscapes, its people and its cities. The National Geographic Traveler magazine was not mistaken in describing it as “the most emblematic destination in the world.” You do not travel to the attractions of Fjord Norway, you go in. The journey itself by road is an experience. 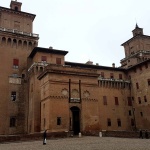 The landscape varies continuously and has attracted visitors from all over the world for centuries. You go from one special place to another, although it is the set of everything that makes the total attraction. 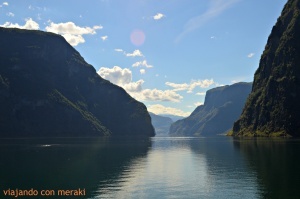 The fjords are not a place in Norway: they are a place in the world. 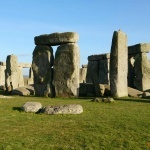 They are a UNESCO World Heritage Site very well preserved. The reason is that this show is not a stage, but a living society. A vital landscape where people live in mutual dependence on nature. Roads meander through this region. Behind each curve there is a new lookout. The landscape changes from the high mountain to the leafy lowlands. Small towns, where with little life is enjoyed to the fullest. Here are 10 of the 18 National Tourist Roads of the country. Routes of experiences where the landscape plays with modern architecture. A road that crosses contrasts and surprises, which delves into the history of living together with nature. A road following the fjords. The mountains. An impressive coast. I leave you the guide of the route that we follow on this trip. I advise you that it is better to do it in the opposite direction than we did. The reason is that we went from more to less impressive landscapes, and perhaps it is better to keep the suspense until the end. We went with Pedro recently had a surgery on the anterior cruciate ligament on a knee, and we decided to do so to start with strength for what could happen at the end. Day 1- Madrid-> Oslo Rygge­, Lake Mjosa,­ Lillehamer, Valley Gudbransdal, Heidal. We fly with Ryanair. Direct flight: 3h 25m. 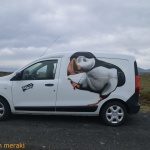 We rented a car with Autoeurope. 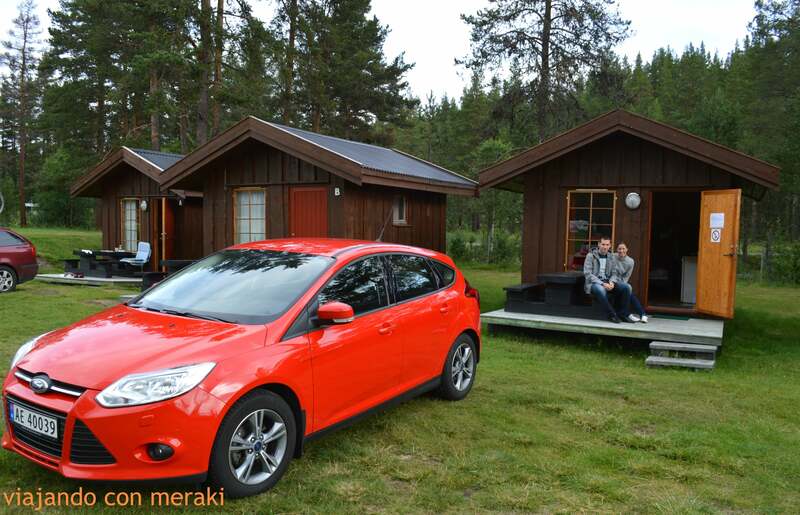 They gave us a Ford Focus in very good condition, which was the one that accompanied us kindly throughout our journey. In Norway there are quite a few roads with tolls . Rental cars give you the option of putting a special sticker on the car’s windshield and each time you pass through the toll you do not have to stop, they directly charge it to the car rental account. We did this and then they charged us (once we finished our trip). We left the airport and the first day was a long ride (5 hours without stopping – 360km), which was too long since the flight was delayed quite a bit and we arrived very late. We went to the interior of the region. First we skirt the largest lake in the country, the Mjosa, to continue to the city of Lillehamer, which hosted the 1994 Winter Olympics. We follow the path of the river to enter the beautiful valley of Gudbransdal formed by one of the Last glaciations which makes it the most important, famous and visited inland landscape of all of Norway. We stopped in a rest area (there are many in Norway and very well conditioned and clean) to eat some salads that we had bought at the airport and finally we arrived at Heidal. 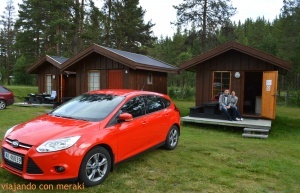 On this occasion we had booked a cabin at the camping “Jotunheimen Feriesenter” (51€/night). The cabins are modest but very cozy. They had left our keys under the doormat because we arrived around 11.30pm. We tried to have a shower without success, because the showers work with tokens that had to be bought at reception (it was already closed). The next morning we bought something for breakfast in the small shop that they had in reception, we paid the night and we started our way through the valley of Gudbransdal, surrounded by the highest mountains of northern Europe. We arrived at the charming village of Lom, to discover the Stavkirke, one of the largest and most beautiful wooden churches of the Viking age. We took advantage to buy some food in the village supermarket. We continued to the Geiranger region, one of the most tourist areas of the country. 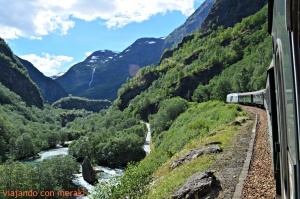 In 2005, the Geiranger and Nærøyfjord fjords were declared a World Heritage Site under the name “Western Fjords of Norway”. There is a detour by car from the Geiranger road to the Dalsnibba mountain (1,500 m altitude) which offers beautiful views of the fjords. We did not take it because to climb you have to pay an entrance and the day was cloudy. 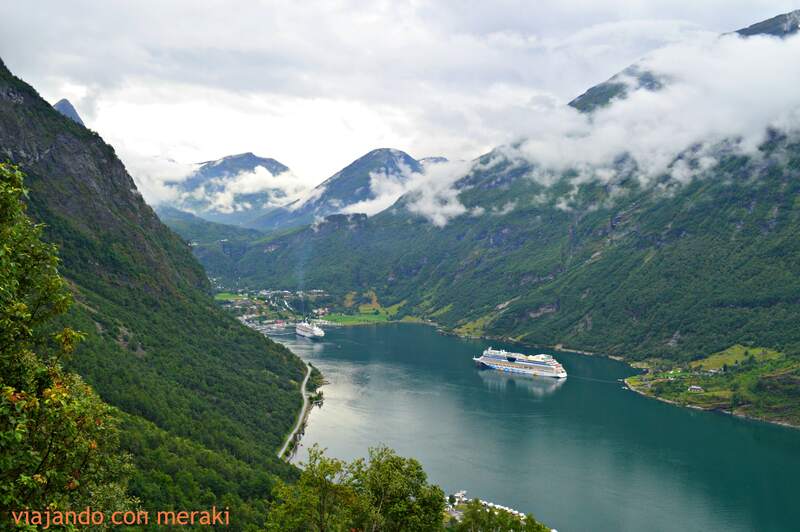 We passed through spectacular fjords, snowy peaks, emerald blue lakes and endless waterfalls. 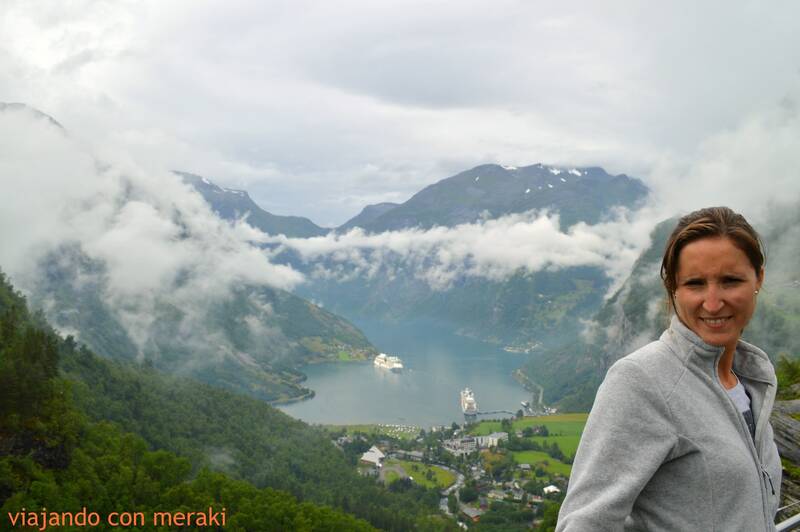 We made a stop at the Flydalsjuvet, the most famous viewpoint in the entire region, just before reaching Geiranger. ACCOMMODATION: Fjorden Campinghytter. Cabin in camping. 89€. This cottage has a seating area, a terrace, a refrigerator, kitchenware and a stove. Bathroom and shared toilet. Towels / sheets with supplement. Bunk beds. They have free WiFi connection. The shower works with coins. Once we made the entrance to the campsite, we decided to ascend a little Ørnevegen road, which leaves from the deepest of the fjord, near the famous waterfalls Syv Søstre (Seven Sisters). From here you can see the best views over the fjord. OPTIONAL: If you continue on this road, you access “Trollstigen”. This road has been upgraded to the National Tourist Highway, with adapted viewpoints and rest areas. 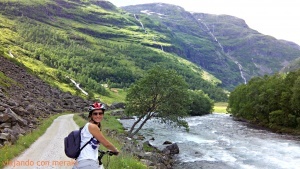 Here you will find attractions such as Trollstigen (the Troll staircase), the Gudbrandsjuvet ravine and Ørnevegen (The Eagle Road). Reinheimen National Park is also located here: it is Norway’s third largest national park, inhabited by herds of wild reindeer. 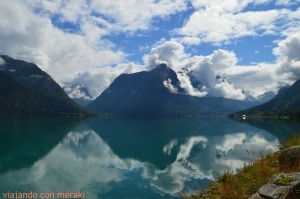 Day 3: Stryn,­ Olden, ­Loen,­ Innvikfjorden,­ Briksdal Glacier. We left Geiranger direction to Innvikfjorden. 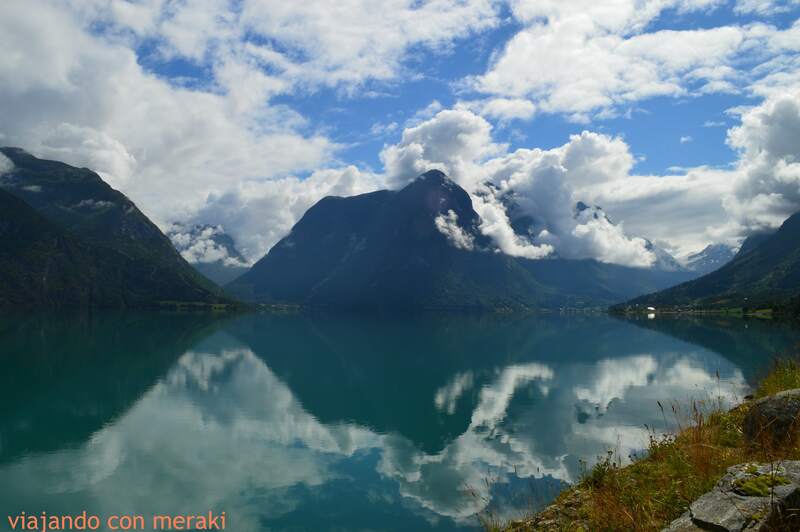 We stopped and visited small towns along the way, such as Olden, Loen or Stryn, three villages surrounded by fascinating nature that are well worth exploring. In Stryn there is a summer ski resort, on the old mountain road. The summer ski center is open from May to July and is located next to the national tourist road, the old Stryn mountain road, Gamle Strynefjellsvegen. We did not visit it but maybe the next one. We continued our way crossing lakes with water coming from the melting of the glaciers with a color that seems totally manipulated. On the slopes of the fjords, farms are world-famous for their location. Finally we arrived at one of the most spectacular accommodations of this and almost all our trips. It was recommended to me by my friend and friend José (who had been there the previous year). You have to book it well in advance, but it’s totally worth it. They are wooden cabins with capacity for up to 6 people, overlooking the lake. From the porch of the cabin you can see, on the left side, a waterfall coming from the thaw and on the right hand the tongue of the glacier… I think about it and my hair is still standing on end! ACCOMMODATION: Melkevoll Bretun. (100 €/night) It has full kitchen with utensils, fireplace for winter, porch… a dream place. Once ready from our wonderful cabin, we decided to walk up from it to the Briksdal glacier. It takes about an hour and a half. The view of this thousand-year-old glacier on foot is also impressive, with its bluish color and the whitish remains that appear from previous avalanches. 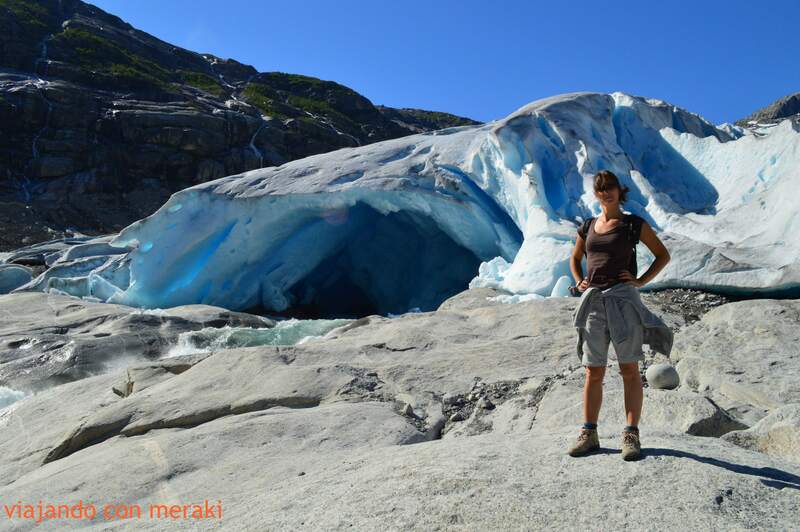 It is located in the Jostedalsbreen National Park and falls from an altitude of 1200m. There are also guided tours inside the glacier with experienced guide but we did not take them. Day 4:­ Lake Jolstra, Boya glacier, ­Nigardsbreen,­ Sognefjord. We left that idyllic and paradisiacal place (where you can stay for a couple of days if you have more time) to Sognefjorden, the fjord of dreams. First we skirted the Innvik fjord from where we took a wonderful mountain road. Then we approached the Jolstra lake , which is a surprising example of the action of the glaciers. We made a brief stop at Boya (one of the 28 arms of the Jostedalsbreen glacier) small but wonderful glacier that we passed by on the way. Later, surrounded by majestic snow-capped mountains, we continued along the banks of the Jostedal River, whose curious turquoise waters will catch your eye. 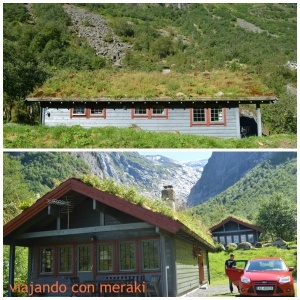 At the end of the day we went to our accommodation of the day, located in the village of Sogndal (point where glacier, mountain and fjord converge), on the banks of the famous Sognefjord or the fjord of Dreams. ALOJAMIENTO: Hostel Sogndal Vandrerhjem. (74€/nithg breakfast included). Sognefjorden is located in the center of the fjord region and reaches 204 km inland. Is the longest. 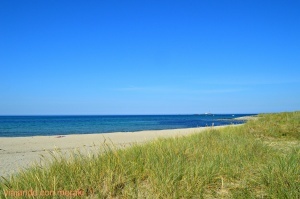 Here is an example of the wildest and most beautiful landscape in the country. The fjords Nærøyfjord, Fjærlandsfjord and Lusterfjord are the most prominent places. 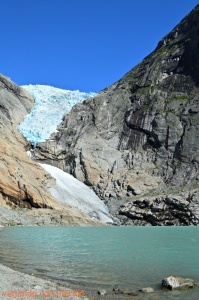 Nærøyfjord is also listed on the UNESCO list of World Heritage Sites. From here you can see the Jotunheimen National Park – Sognefjellsvegen: The most beautiful and wild mountain with the highest peaks in Norway. Store Skagastølstind (2,403 m above sea level) can be admired from the Sognefjellsvegen road, which crosses the National Park, the first National Tourist Road of Norway, and the highest mountain pass in Northern Europe. Half of the charm of Sognefjord are the beautiful and striking villages along the 204 km of fjord like Balestrand, famous for its houses with Swiss-style ornamentation. At the end of one of the most recondite arms of the fjord is the village of Lærdalsøyri. One of the most famous salmon rivers in Norway flows right through the old town. We got up and headed to Kaupanger. 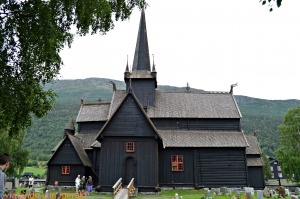 In this city you can visit another of the famous Viking wooden churches, the largest in the region. We take a ferry from Kaupanger to Gudvangen. We had previously bought the ticket online (945 NOK- http://www.fjord1.no/eng/touristservices/gudvangenkaupanger2). This ferry crosses the Fjord of dreams, it cost us about 150 € both, car included (you park inside the ferry, very curious too). It allows to experience the sensation of the cruise passengers and to have the vision of the fjord from inside. You will find some of the most spectacular photos, if you go by car or caravan, it is mandatory to do so. We were lucky to see porpoises swimming through the fjord. OPTIONAL: Curiosity, to go to Laerdal you have to go through the second longest tunnel in the world, (about 25 km). We did not do it, but you will see that there are many tunnels and very long, all along the route. Arrived at Flåm . Village located in the center of the fjord region and in the heart of the Aurland fjord, a tributary of the great Sogne fjord (204 kilometers long and 1,308 meters deep). Once here, do not forget to climb the Flåm Railway , known worldwide for the spectacular nature of its route and recognized by National Geographic Traveler as one of the most beautiful in Europe. The best option is to take the train to the mountain station of Myrdal and rent a bike to do the opposite route to Flåm again. Everything is downhill, quite easy and the landscapes are wonderful, both in the ascent on the train and in the descent by bike. The train of Flåm crosses one of the rail lines with the highest level of the world, passes through 20 tunnels and took 20 years to build. The railway line has 20 kilometers and a height difference of 865 meters. The train runs all year. ACCOMMODATION : Brekke Gard Hostel . It is like a big house where each room is rented and kitchen and bathroom are shared. The site is spectacular, but the house is old, made of wood and you can hear absolutely everything. Day 6: ­Flam, Voss,­ Bergen. Today we will make our way from Flåm to the famous Bergen. OPTIONAL: Before starting the road to Bergen, we decided to walk a bit in the opposite direction to which we are going to reach the Stegastein viewpoint : 650 meters above sea level, it is on the road of Aurlandsvegen mountain (a national tourist route). 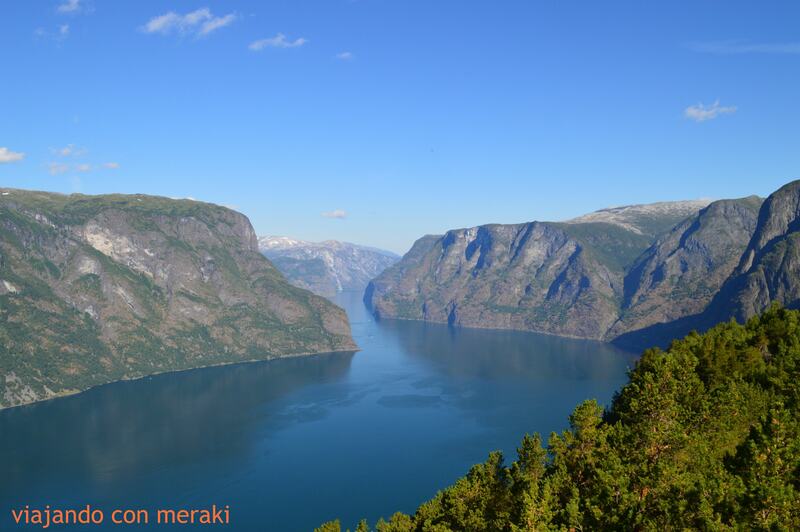 Located 16 kilometers from Flåm, it stands out above the beautiful Aurland fjord. It’s worth coming up here. 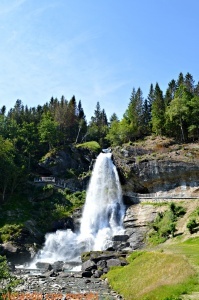 We find the first stop on the E16: the Tvindefossen waterfall. We follow the path and we have a mandatory stop in Voss and its Steindalfossen waterfall, you walk behind (curious, you catch on the road). Voss has international fame as the capital of extreme sports, and every year is the host of Ekstremsportveko, the Week of extreme sports. In addition to its adventure sports, it is famous for its agriculture and traditional cuisine. The Vossafår and Fenalår mutton steaks usually go for sandwiches and sandwiches, although you can order the Vossameny, the “Voss menu” in cafes and restaurants. 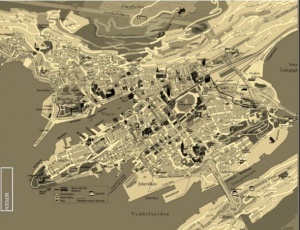 Finally we arrived at Bergen, the capital of the fjords. It is not very easy to park in the center. We left the car on a street near the hotel although we never knew if it was legal or not. 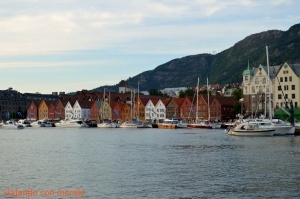 We made the entrance to the hotel and took advantage of the long days to walk around the harbor of the town (Bryggen), which is a delight with its colorful houses and get lost in the nearby streets. For dinner we went to one of the many stalls in the harbor to try the Norwegian salmon. This medieval wharf, full of traditions, has also been declared a World Heritage Site by UNESCO, you will see how nice it is the colorful and picturesque Fisketorget (or fish market), the terraces of the port, or just letting ourselves go aimlessly for this wonderful city. 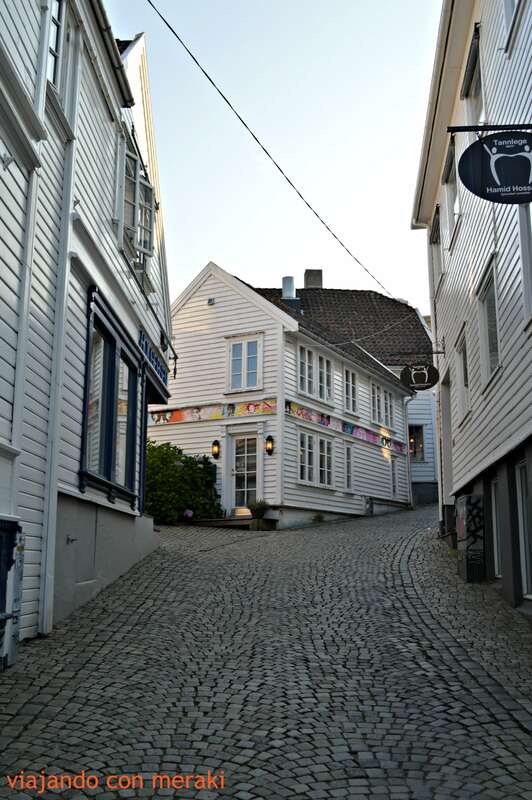 ALOJAMIENTO: P­Hotels Bergen*** (113€/night. breakfast included). Hotel in the city center. Bergen is the entrance par excellence to the fjords. 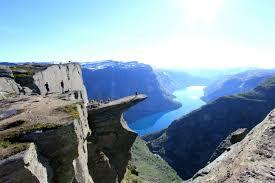 It is located between the Hardanger and Sognefjord fjords. Its urban center is compact and optimal for the pedestrian so that it has been designated European Cultural City. 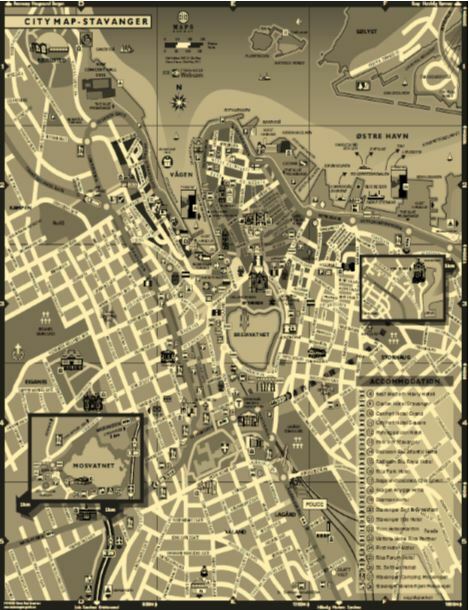 While Rome is built on seven hills, Bergen is famous as “the city among the seven mountains”. For art lovers it is good to know that the art museums of the city and many of the galleries are concentrated around the Lille Lungegårdsvannet central park. Bergen is famous for its varied cultural offerings, so it is best to look at the calendar first to see which shows are not to be missed. In the morning you can take a panoramic tour to appreciate the Church of Santa Maria, the old German quarter, the Nordness district, the Rosenkrantz tower and the Haakon castle. A must-see is Mount Floyen, which can be reached by foot (as we did) or by the Fløibanen cable car (the journey takes 7 minutes). The views are very beautiful. Once up, there are several marked hiking trails, of different levels and durations. 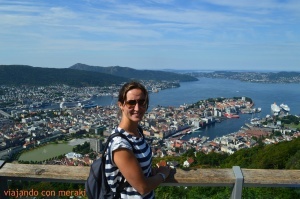 From the great viewpoint you will see the magnificent views of the city, the mountains and the fjords. OPTIONAL: Gamle Bergen. Open-air museum of houses across the country. A large outdoor space located in the Gamle Bergen park in which an old city composed of some 40-50 wooden houses faithfully representing buildings from the 18th, 19th and 20th centuries has been painstakingly reconstructed. We did not see it. 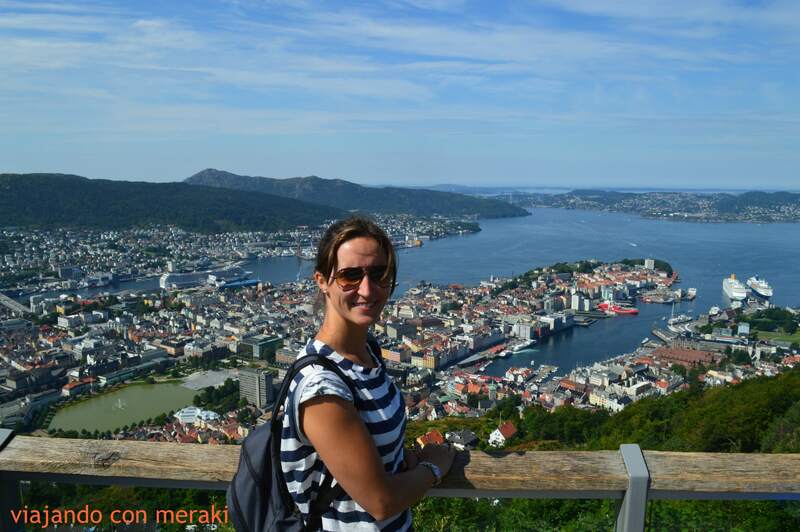 When we finished the Bergen visit, we started the way to Stavanger. 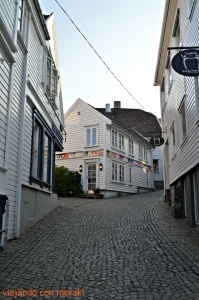 (5 hours by car) We arrived at Stavanger , the capital of Rogaland, with its neighborhoods of buildings made of white wood, typical of the seafaring cities of the North Sea. 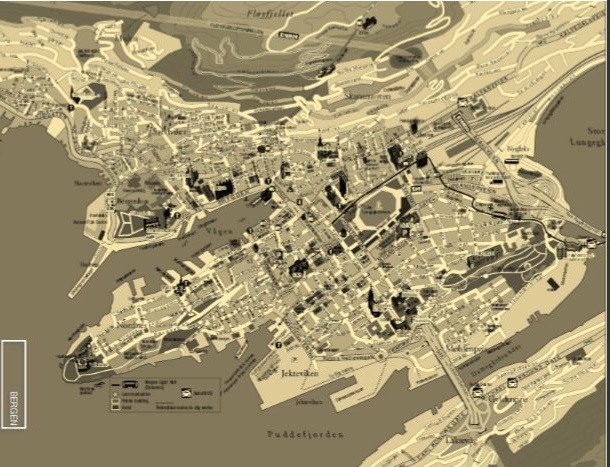 ALOJAMIENTO: Stavanger St Svithun Vandrerhjem. (83€ breakfast included) WIFI and private bathroom. This hotel is located on the outskirts of the city, next to a hospital. It is the hotel where family members who come to see the sick stay. For example, we had breakfast with women who had just given birth, since the cafeteria is shared. After checking in at the hotel, we visited this charming city: we walked through the old quarter of Straen, with its 173 wooden houses – the largest concentration of this type of houses in northern Europe – visiting its Cathedral of medieval times (it is the oldest in the country, dates from 1125) or the Valberg tower (now the Museum of the Guard, because it is visible at any point and serves as an orientation for the traveler). It was the tallest building in the city 27 meters and was used in 1853 as a key surveillance point to warn the population of fire hazards. We also visited Lake Breviavatnet (called “the bright eye”) and took a walk through the harbor. The town is small but it is very nice to take a walk. Stavanger is surrounded by a green and fertile coastal landscape, very close to the beautiful nature of the Lysefjord. In this city you will find some of the main restaurants in the region, famous for their creative use of local products. At present, the old port warehouses house great restaurants and lively places. The area of old wooden houses and charming shopping streets form the heart of a modern and cosmopolitan city. We did not try any of these restaurants, because we were on a budget. Finally, for those who appreciate good art, they should visit the Rogaland Art Museum and take time to study the wonderful paintings by Lars Hertervig. When we arrived, they were closing, so we could not visit either. Day 8: Stavanger, Preikestolen, Jaeren,­ Kristiansand. Preikestolen (the Pulpit Rock), is the most famous tourist attraction and crowns the Lysefjord fjord at an impressive height of 604 meters. This rocky platform, about 600 square meters, was formed 10,000 years ago as a result of the thaw. You leave from the Port of Stavanger and you must take the ferry “Stavanger-Tauy”, then you have to take a bus until the start of the climb to Preikestolen (it’s a parking, the mountain shelter Preikestolen Fjellstove). It is better to go early to avoid too many tourists and overcrowding. The round trip can leave for around 25 € per person. The climb is approximately two hours per accessible trail. The views are spectacular so it is very worthwhile. Once at the top, we admire the fabulous world-famous views. Once we returned to Stavanger, our option B started and we made our way to Kristiansand. 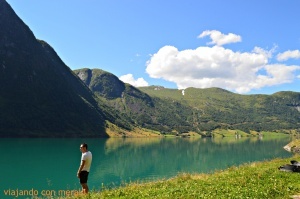 The Norway of the Fjords is something more than abrupt mountains and high peaks. 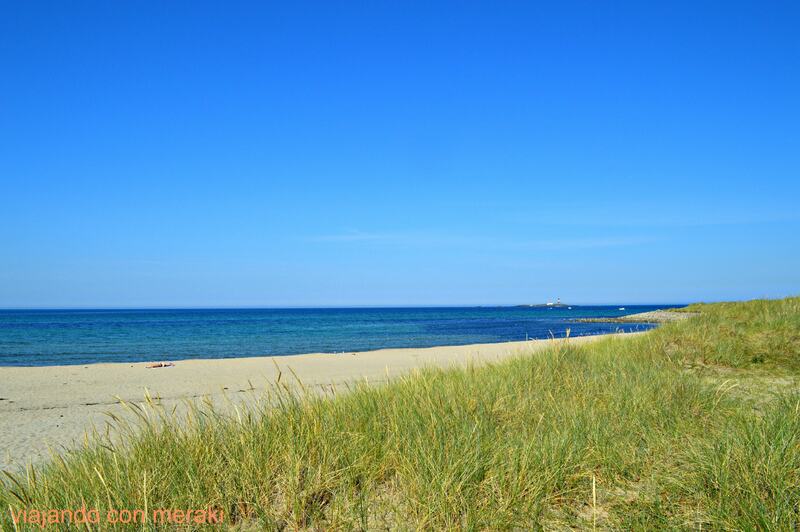 The roads along the Jaeren beaches are diaphanous skies, wide horizons and endless sea. There are green meadows and fabulous views in all directions. This area is famous for its peculiar and beautiful light, its beaches extend to the horizon. The weather was awesome and we could even go for a swim. Then we continued our way back to Oslo. ALOJAMIENTO: Hald Pensjonat. Double room (80€ breakfast included). The room is very simple but the surroundings and common areas are very nice. It has a beautiful garden. Day 9:­ Back to Spain. Departure from the hotel to the Oslo Rygge airport. We did not stop to visit Kristiansand, but we read that the fishing pier is the most thriving and welcoming area of the town and is much more than a fish market. It has lively restaurants, beautiful canals and recreational boat traffic. We returned with Norwegian airlines to Madrid, 4 hours flight. 1. The Troll tongue, Trolltunga. One of Norway’s most spectacular hiking destinations is located in Hardanger. The tour is about 20 km and lasts about 8-10 hours round trip. The elevation is 800 meters. It is possible to go to the same Troll tongue but you have to be careful as the tour goes through high mountain where there is no mobile coverage. 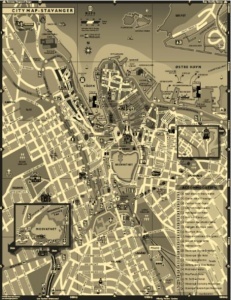 It is necessary to bring suitable clothes and shoes, map and compass, food and drink. By contacting the Odda Tourist Office you can get more information and a map of the route, which starts in Skjeggedal. The interesting places are many and are all along the route, among others the dam Ringedalemningen, “pots of giant” and the Troll tongue itself. The more adventurous can also go by a via ferrata, a safe climbing route to the Troll tongue with a guide of the company OpplevOdda. The best season is from mid-June to mid-September. Once reached the top, you can enjoy one of Norway’s most fantastic viewpoints. You have to be careful if you walk through the same “troll tongue”, because there is a long fall to the precipice. Kjerag is the monarch vantage point of Stavanger, in Ryfylke. With its 1,000-meter peak on the cliff, the Kjerag platform rises high and wild in the interior of the Lysefjord. Most are happy to enjoy the views of the fjord from the platform itself, although for some, the highlight comes when the photo is taken in Kjeragbolten, the Kjerag’s Bolt, a round block of stone wedged in a crack in the mountain. 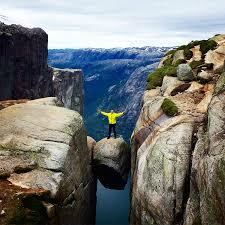 Kjerag has also become a popular destination for base climbers and jumpers. The tour is about 10 km and lasts about 56 hours round trip. Madre mía. Esto .e lo tengo que estudiar. Acabo de empezar a buscar info para ir este mes de agosto pero el alquiler del coche es carísimo, no?